For your teen to grow in Christlikeness, he must first know what Christ is like. This quiz, test, and review book over the study of the Gospels reinforces specifics about the life of our Example. It also reviews the story of our English Bible and specifics concerning each of the Gospels. The quiz, test, and review book is correlated with the Bible (King James Version); Jesus and His Followers, 2nd ed. ; and Jesus and His Followers Teacher Edition, which includes curriculum/lesson plans. Memory verses are tested separately as explained in the curriculum. 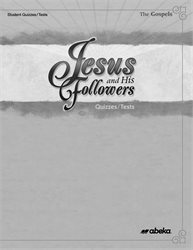 Answers and grading instructions are sold separately in Jesus and His Followers Quiz/Test Key. Grade 11. One semester. The 8 content quizzes (4 each quarter) help you to know the effectiveness of your teaching and of your teen’s learning. One nine-weeks exam and one final exam for this semester Bible course provide your teen with regular review and reinforcement and provide you with quarterly evaluation. The 2 pre-exam review sheets provide additional reinforcement of learning, building your teen’s confidence before he takes the exam. A variety of objective testing formats such as modified true/false, multiple choice, short answer, and matching require your teen to consider the content from different aspects and hold his attention. Since each quiz, test, and review sheet specifies the section of the textbook it covers, you can easily adjust quizzes and tests to your schedule for greater flexibility.